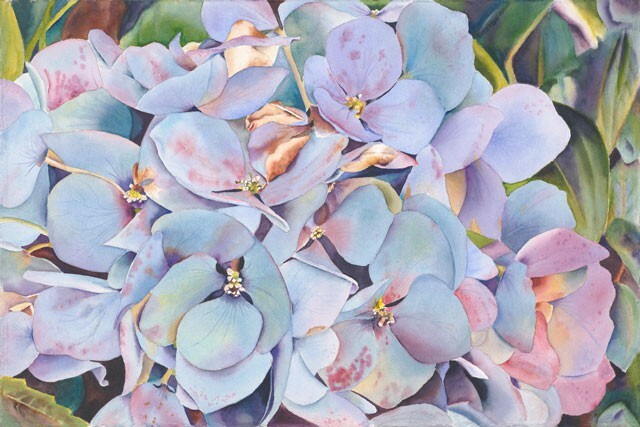 SONDRA BLAKE HAS BEEN A RESIDENT OF TIBURON SINCE 1985 AND HAS BEEN PAINTING IN WATERCOLOR FOR THE LAST 15 YEARS. SHE HAS STUDIED WITH LOCAL ARTISTS CHRISTINE COHEN, JULIE COHN, JERRY STITT, CARA BROWN, ELIZABETH KINKADE (WASHINGTON), AND ANN ABGOTT (FLORIDA). 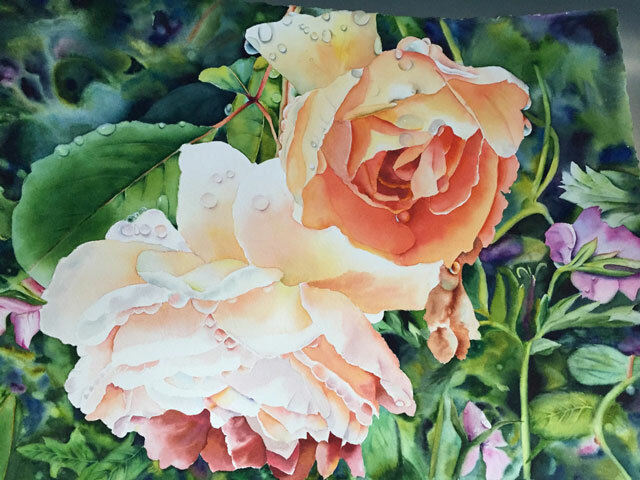 FOR THE LAST 3 YEARS SHE HAS PAINTED WEEKLY WITH CARA BROWN AND THE 537 MAGNOLIA AVENUE ARTISTS, A GROUP OF FELLOW WATERCOLORISTS WHO HAVE JUST COMPLETED THEIR FIRST TWO PUBLIC EXHIBITIONS. HER PAINTINGS HAVE HUNG IN SHOWS AT THE BANK OF MARIN, THE BAY MODEL, ROCK HILL GALLERY OF TIBURON, THE TIBURON TOWN HALL, THE TIBURON ART AND GARDEN CENTER, THE SAN RAFAEL LIBRARY, THE MARIN VETERANS MEMORIAL AUDITORIUM AND THE MARIN COUNTY FAIR. AS A PERSONAL STATEMENT SHE SAYS, “I HAVE ALWASY BEEN DRAWN TO COLOR AND TEXTURE, ESPECIALLY AS DISPLAYED IN NATURE. IN MY EARLIER YEARS, AS A BUSY YOUNG HOMEMAKER AND MOTHER, I SPENT MAY HOURS SEWING, KNITTING, TAILORING, WALLPAPERING, PAINTING, REFINISHING FURNITURE AND GARDENING. SO IN LATER YEARS, GETTING INTO WATERCOLOR PAINTING WAS A NATURAL TRANSITION. THE FACT THAT IT WAS DIFFICULT MADE ME JUST WANT TO TRY THAT MUCH HARDER. I WAS HOOKED ON THIS BEAUTIFUL MEDIUM AND BOUGHT EVERY TECHNIQUE BOOK I COULD FIND. MY GARDEN IS A CONSTANT SOURCE OF INSPIRATION AND THE FACT THAT I PAINT TOGETHER EVERY WEEK WITH VERY TALENTED ARTISTS KEEPS ME ALWAYS TRYING TO GET BETTER.